May has been an excellent month so far with much more settled weather and a chance to get offshore. On the reefs bream have shown up in increasing numbers and size. With the bream are a few nice smoothies both common and starry into double figures. We are also picking up undulate and thornback rays which certainly put a bend into a bream rod. Offshore there have been excellent numbers of cod – perhaps this will be another year link the “brittle star” year of 2008. Most have been in the 4-7lb range but there are enough double figure fish to keep life interesting. Best so far was our April fish of the month a 21lber which fell to Joe Noke. The cod are voracious feeders and don’t give the Pollack a chance to get to the lures leading to cod only wreck trips! Colin for Portsmouth hooked up what he thought was the wreck while drifting with a mackerel flapper near slack. It however turned out to be a 32lb ling which is a new boat record. Colin Low is now known as Coling to his mates! We have now completed our first Alderney trips of the year. As well as the excellent wrecking on the trip over and back the fishing for flatfish was superb with good numbers of turbot. Although the size was generally 3-7lb there were enough 10lb fish to keep interest up with a good number of smaller fish being returned to fight another day. 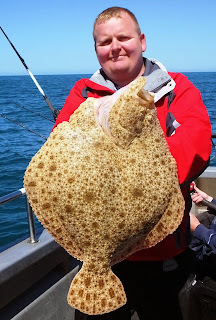 As well as the turbot we had some nice brill to 5lb. 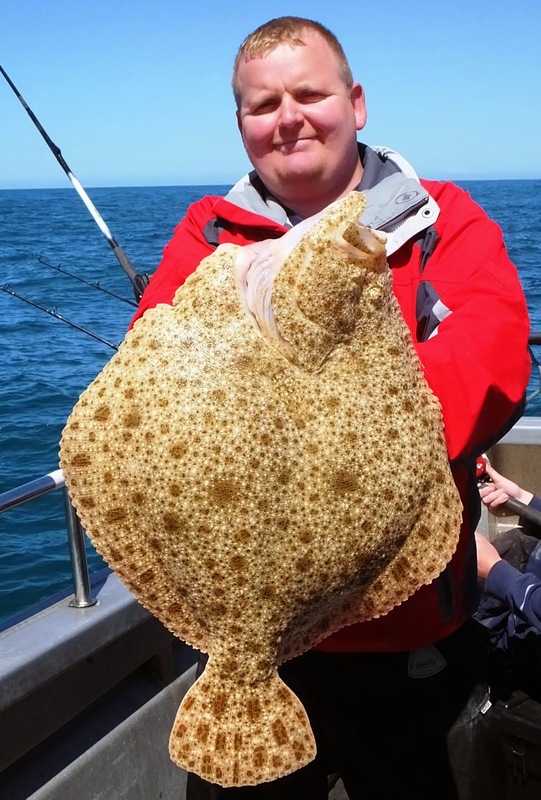 What promised to be a monster turbot turned out to be a large and very energetic blonde ray. Silver Spray has been out of the water for a major refit which has included two new Iveco Neef 420Hp engines giving a top speed of 29 knots and a 2 knot increase in cruising speed while being much quieter than our previous Cats. We have also increased fishing space by a third by adding walk around rails on the foredeck. The livebait system has been increased to the same capacity as Silver Spray ll and we have invested in more large Iceytek coolboxes to keep fish fresh. To top things off the navigation electronics have been updated with the latest Raymarine digital displays and finally the galley has been refitted. Quite a project which was completed in 3 weeks and which we hope our anglers will enjoy during the summer.